Ermitage hosted a week long Pre-Conference in Paris in advance of the Round Square International Conference 2016 being held at Stiftung Louisenlund, Germany and Aiglon College, Switzerland. Ermitage welcomed over 40 students and staff from Round Square partner schools including Bayview Glenn (CAN), Billhook College (AUS), Scindia (IND), the Punjab Public School (IND), the Doon School (IND) and Saint Andrew's School (USA). The week included an enriching discovery of Paris and northern France. 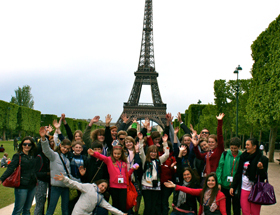 Highlights of the experience included visits to the Louvre, Notre Dame and Montmartre, just to name a few, with an exciting celebration on the final evening where the group enjoyed dinner atop the Eiffel Tower and a dance party bus tour around the city of lights! For a little rest and relaxation, the group concluded their week with a 2-day cultural excursion and invigorating 70 kilometers bike tour of Normandy. Please visit our RS Reporter's Blog for further information about similar leadership opportunities at Ermitage.